The purpose of the current study was to develop a model from community engagement (CE) process data to guide future CE for a focused health problem. Community-based participatory research was used to engage older adults affected by cancer and their family caregivers in eight cancer clusters in one northeastern U.S. state. CE was focused on informing participants about a national telephone helpline offering psychosocial cancer services. A purposeful sample by settings in the cancer clusters yielded an estimated 200,500 individuals who participated in information sessions, health fairs, sporting events, and the media (i.e., print, radio, or television). A general inductive approach was used to analyze CE data and resulted in a four-phase model that health professionals consider in initiating CE. Strategies are discussed for resolving two roadblocks that were identified. 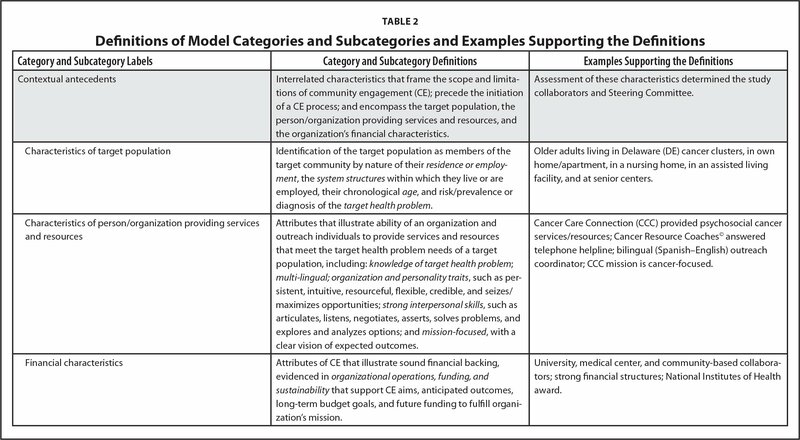 This model serves as a guide to standardize CE that informs a community about available services to address a focused health problem. Community engagement (CE) is “the process of working collaboratively with groups of people who are affiliated by geographic proximity, special interests, or similar situations with respect to issues affecting their well-being” (Centers for Disease Control and Prevention [CDC], 2011, p. xv). Collaborators may include individuals (a) initiating the engagement, (b) employed in community-based organizations in the target community, and (c) living in the target community (Bowen, Newenham-Kahindi, & Herremans, 2010; CDC, 2011; Hanson et al., 2014; McCloskey et al., 2011). The underlying premise of CE is to improve public health (CDC, 2011). Expand CE to Delaware's older adults affected by cancer and their family caregivers. Evaluate CE in older adults affected by cancer and their family caregivers in Delaware. Develop a model to sustain CE with the target population. Aims 1 and 2 comprised the parent study. These two aims were met using call data from a national cancer telephone helpline and comparing reasons for calls to the helpline before and after CE in an effort to determine whether the Institute of Medicine (IOM; 2007) recommendations to include psychosocial health needs in cancer care had an impact on the reasons for calls to a cancer telephone helpline (Klemm, Rempusheski, Jurkovitz, Kolm, & Zhang, 2014). Call data included demographic and cancer-related characteristics of 650 callers before CE and 2,725 callers after CE and were not used in the development of the model. Implementing, documenting, and modeling the CE process were the foci of Aim 3, the results of which are reported in this article. Therefore, the purpose of the study reported herein was to develop a model from CE process data to guide future CE for a focused health problem. Three related public health factors provided evidence to support the need for this study: (a) cancer incidence and the identification of cancer clusters in Delaware, (b) Delaware's changing demographics pertaining to an increasing number of older adults and Spanish-speaking older adults and their family caregivers, and (c) the small percentage of older adults or their caregivers seeking assistance from a national cancer telephone helpline. Delaware, at 96 miles long, 1,982 square miles of land mass, with an estimated population of 962,000 (Delaware.gov, 2018a,b), is ranked second among U.S. states in age-adjusted all-cancer incidence (all-site cancer) and 18th in cancer death rates (CDC, 2018). Analysis of Delaware's 5-year cancer incidence data resulted in defining eight of the state's 27 Census County Divisions as cancer clusters (Delaware Health and Social Services [DHSS], 2008) across the state's three counties: New Castle, Kent, and Sussex. The CDC (2013) defines a cancer cluster as a “greater-than-expected number of cancer cases that occurs within a group of people in a geographic area over a period of time” (para. 1). Six clusters (two combined all-site, lung, and prostate cancers; one all-site cancer; one combined all-site and lung cancers; one prostate cancer; and one colorectal cancer) were identified in northern urban/suburban New Castle County (DHSS, 2008), which comprises 22% of Delaware's land mass and has a population of 1,263 individuals per square mile. One all-site cancer cluster was identified in middle urban/suburban Kent County, which comprises 30% of Delaware's land mass and has a population of 277 individuals per square mile; and one lung cancer cluster was identified in southern rural/farming/coastal Sussex County (DHSS, 2008), which comprises 48% of the state's land mass and has a population of 211 individuals per square mile. One New Castle cluster is located to the immediate north of the New Castle–Kent county boundary line and the single Kent cluster is located immediately south of this boundary. The Sussex cluster lies approximately 56 miles south of the Kent cluster (Delaware.gov, 2018a,b). Individuals 65 and older comprise approximately 18% of Delaware's population, with this population projected to increase to 30% by 2030 (Delaware.gov, 2018a). Sussex County has the highest percentage of individuals 65 and older, estimated at 26.7% (Delaware.gov, 2018a). In the United States, individuals 65 and older have the highest prevalence of cancer in adults at 18.2%, which increases to 21.8% in individuals 75 and older (National Center for Health Statistics, 2016). Information about cancer diagnosis and treatment is usually provided to individuals with cancer and their families by health care providers; however, a discussion about social, lifestyle, financial, and other psychosocial health needs is often inadequate (Ekberg et al., 2014; Hawkins et al., 2008; IOM, 2007; Klemm et al., 2014). Older adults with cancer may have different and more complex needs for resources and services than younger individuals due to pre-existing comorbidities and functional deficits. Therefore, assistance in complex care, financial, and psychosocial decisions is particularly relevant for older adults affected by cancer and their family caregivers. The ethnic/racial composition of Delaware is 62% non-Latino White, 23% Black, 9% Latino, and 6% other and two or more races (Delaware.gov, 2018a). The ethnic demographic change is related to an in-migration of Spanish-speaking older adult members of families and a concentration of Latino individuals in the inner city cancer cluster of New Castle County (10% Latino) and farmland cancer cluster of Sussex County (9% Latino) (Delaware.gov, 2018a). Spanish-speaking resources are provided at two Latin American health/community centers, one each in New Castle and Sussex counties; neither is cancer-focused. Cancer Care Connection (CCC), a non-profit free national cancer helpline, provides social, lifestyle, financial, and other psychosocial health coaching to individuals with cancer and their family caregivers (access http://www.cancercareconnection.org). CCC uses a telephone-based social worker support model focused on self-efficacy, empowerment, and identification of individual strengths. Master's-educated, English-speaking Cancer Resource Coaches© (CRCs) answer incoming telephone calls and access a customized database of approximately 4,000 local and national resources to address callers' needs. The goals of each call include a psychosocial assessment and provision of resources and contact information within the caller's geographic area to resolve the presenting problem, explore concurrent issues, and plan the next steps to address each concern. During the 17-month period preceding the study, CRCs had received 650 distinct calls, 58% from Delawareans, and 15.7% from older adults or their family caregivers; however, 39.2% of callers did not provide their age (Klemm et al., 2014). Spanish-speaking CRCs were not available at CCC. Due to budget constraints, CCC did not have a marketing plan or staff to initiate CE. Information about its free public services was limited to a website, word of mouth, pamphlets, and business cards that were distributed at local cancer-related events and advertisements in regional/national social work conference proceedings. The following three CBPR principles of CE activities fit best in an investigation of the public health factors precipitating the current study: (a) emanate from the community, (b) emphasize and build on the community's strengths and resources, and (c) communicate in a collaborative and authentic manner (Israel, Eng, Schulz, & Parker, 2005; Minkler & Wallerstein, 2003). Therefore, a CBPR design that was grounded in Systems Theory, directed by an interdisciplinary research team, and guided by a Steering Committee of community stakeholders was used to individualize CE interventions by cancer cluster geography, site type, age, and ethnicity/race. The CBPR design used an instrumental, transitional approach focused on engaging community networks, virtual mechanisms, and organizations (Braun et al., 2015; Dozier, Hacker, Silberberg, & Ziegahn, 2011; Preston et al., 2014); educating a community with two-way communication (Bowen et al., 2010), evolving depth and breadth of interactions (Carman et al., 2013; CDC, 2011; McCloskey et al., 2011; Palmer-Wackerly, Krok, Dailey, Kight, & Krieger, 2014); and cultural sensitivity toward achieving shared knowledge and an insider's perspective (Braun et al., 2015; Carman et al., 2013; CDC, 2011; Kaufmann, Buck Richardson, Floyd, & Shore, 2014; Kleinman, 1980; Palmer-Wackerly et al., 2014; Peterson & Gubrium, 2011), evolving trust, and investigator control. Study collaborators shared a geographic proximity and expertise in psychosocial health needs affecting the well-being of older adults with cancer and their family caregivers. Study team members contributed diverse professional knowledge and skills and included two university-based nurse researchers (with programs of research in oncology [P.R.K.] and gerontology [V.F.R. ]), three national cancer helpline staff, and a Steering Committee of six stakeholders employed in community-based agencies. Stakeholders included four individuals from the New Castle County cancer cluster: nurse navigator at the local NCI-designated cancer center; bilingual community liaison at the Latin American inner-city community center; university professor and member of the diversity committee of the Delaware Cancer Consortium and liaison to Delaware African American churches; an administrator of a nationally accredited senior center and liaison to the Delaware Aging Network; and one representative each from the Kent County cancer cluster (nursing home/assisted living center administrator and state-wide long-term care liaison) and the Sussex County cancer cluster (long-term care administrator, educator, and geriatric clinical nurse specialist). A bilingual English–Spanish, master's-prepared individual experienced in cancer care CE was hired as the study's out-reach coordinator and CCC staff as a resource for Spanish-speaking callers. A purposeful sampling strategy was conducted for participants by selected settings (Creswell & Poth, 2018). Study settings were places in which older adults live, work, and socialize in Delaware's cancer clusters, and included 37 nursing care/assisted living facilities, 30 senior centers, and various community settings. An estimated 200,500 older adults and their family caregivers in Delaware's eight cancer clusters participated in the planned CE, either by in-person contact (n = 500) or through print, radio, or television media. The study was approved by the University of Delaware Institutional Human Subjects Review Committee. No participant identifiers were collected; therefore, written consent was not required. CE activities focused on engagement with older adults, family caregivers, health professionals, legislatures, and community networks within Delaware's cancer cluster geographic boundaries, ethnic/racial organizations, and services. 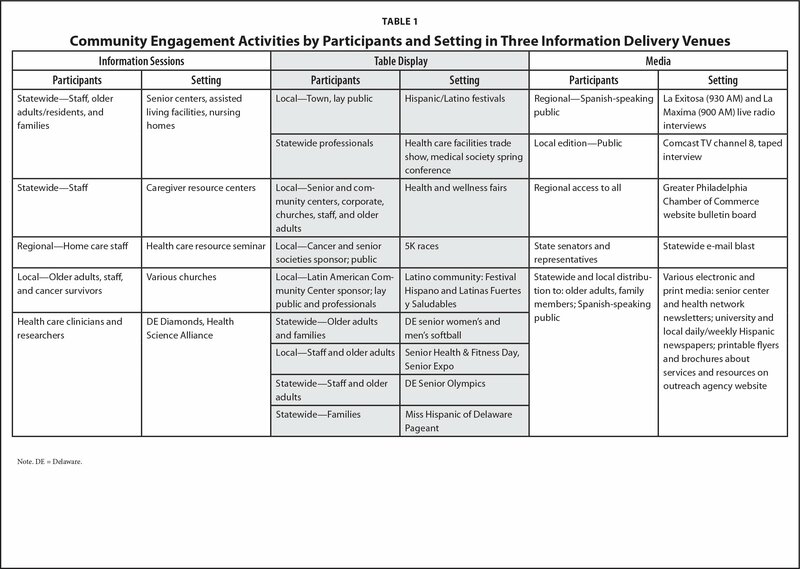 The engagement process entailed five implementation strategies (i.e., initiating contact, follow-up, determining venue for information delivery, scheduling, and finalization of information delivery) across population-specific settings (i.e., senior centers, nursing homes/assisted living facilities, and the Latino and nursing greater communities). Engagement overlapped settings to create a smooth, continuous stream of active CE statewide. Engagement strategies were negotiated between the out-reach coordinator and setting contact individuals. The outreach coordinator initiated engagement by telephone to individuals identified by the Steering Committee and other members of the study team. Contact individuals included administrators, chairpersons, social workers, and other key persons at identified settings within the cancer clusters. Verbal interaction during telephone contacts followed a study team–devised script. When possible, telephone appointments included a discussion about the contact person's preferred method of information delivery, the population to whom information would be targeted, and potential dates and venues at which information could be delivered. After telephone contact was established, the outreach coordinator sent an e-mail verifying information shared verbally in the telephone conversation. If no telephone contact was established (e.g., two or more telephone attempts with no response or call-back), and a specific e-mail address for the contact person was unavailable, a letter of introduction was mailed via U.S. postal service and/or e-mail to the setting with attention to the identified contact person. Twenty-three percent of telephone contacts yielded a date and venue for information delivery. The coordinator left scripted voicemail messages to all others and included details for returning a telephone call. Forty-four percent of voicemail contact individuals returned a call and provided a date and venue for information delivery, 28% required further follow up to negotiate a strategy for information delivery, 11% voiced “no interest, too depressing,” 5% no longer met study setting criteria, and 12% did not respond after follow up. Venues for information delivery included information sessions, table display, and media. Several settings chose all three venues with information delivered initially to administrative staff, then to older adults and family members in groups, and/or at a health fair or screening table display, and as advertisement in their newsletter or website. Dates for information delivery began as soon as 1 week after initial contact and were scheduled for up to 6 months later. Collaboration with cancer and other health-related organizations for events within the cancer clusters were explored and resulted in incorporating CE within these expanded community settings. For example, CCC service announcements were included with public service media and printed announcements about prostate and colorectal cancer screenings being offered within relevant cancer clusters. Most often these screenings were held at the local cancer center and health care agencies at which table displays about CCC services were set up. Finalization of information delivery required repeated follow up to ensure venues, schedule, and materials were prepared and fit population and anticipated number of participants. CE participants received information about cancer care and helpline services. For events such as senior softball games, fresh fruit slices and other snacks known to reduce cancer risk (American Institute for Cancer Research, 2016) and water were provided to draw participants to the table display of information materials and engage them in conversations about CCC services. Information was tailored to population and dominant cancer incidence by cluster. For example, greater emphasis was given to information on screening for prostate and colorectal cancers in participants from New Castle County, and lung cancer in participants from Sussex County. Group and health fair CE participants ranged in size from approximately 75 to 3,000, with a median of 200. CE implementation strategies, data collection, and initial analysis occurred simultaneously over a 12-month period during 2010 and 2011 (not including holiday periods in November and December). The outreach coordinator made all contacts at study settings, met with individuals, and negotiated and spoke at scheduled venues; distributed more than 3,000 information materials such as branded canvas bags, magnets, and brochures; participated in Spanish radio interviews; and documented all CE data. The outreach coordinator was both a participant and observer during data collection (Patton, 2002). Members of the study team participated in selected venues when events were scheduled simultaneously in different parts of the state. In addition, the CCC executive director was interviewed for a recurring local television broadcast. Table 1 summarizes the CE activities by venue, participants, and setting. Observational Guide. A study team–devised spreadsheet was used to document the numeric and contextual aspects of each engagement activity (Spradley, 1980). Items included contact person; attempts to contact; type of activity; setting; number of participants engaged; verbal, written, and electronic information delivered and requested; behaviors exhibited; and number and type of information materials distributed. All entries were dated. A fieldwork journal was maintained by the outreach coordinator with her objective perceptions about the activities, situations, interactions, information delivered, and conversations with engaging participants (Spradley, 1980). Documentation also included adaptation of procedures, notes for follow up, obstacles, and outcomes of contacts. All entries were dated. CE data were entered in a centralized online password-protected spreadsheet. Logged entries were initially analyzed for emerging patterns of the process, structure, and outcomes, and were clarified during the data collection period. For example, the outreach coordinator provided weekly reports about activities to the principal investigators and quarterly reports to the Steering Committee. Observations, logged experiences, descriptive data, and alternative contacts and strategies were discussed at quarterly meetings. These interactions provided further opportunity for identifying the evolving structure and particulars of the engagement process. A general inductive approach was used to analyze the contextual and numeric CE data for (a) condensing data into overarching constructs, (b) establishing links between constructs, and (c) developing a model that illustrated the process (Patton, 2002; Thomas, 2006). The initial analysis during data collection allowed the researchers to keep returning to the logged observations and study team discussions to clarify constructs and links. This process has been conceptualized as the data analysis spiral (Creswell & Poth, 2018), ranging from collection through coding of constructs, interpreting, and representing data visually. After extensive discussions, reading and re-reading CE process documentation, and think time for synthesis, key ideas that emerged about the (a) population and settings before CE began, (b) CE strategies, and (c) CE outcomes were identified and listed. The key ideas were incorporated in the first draft of a diagram that outlined the CE process. Using a systems framework, Draft 1 of the model included antecedent characteristics of the population and setting, three distinct sequential periods or phases in the process that were initially labeled Strategies, and sub-labeled Entry (Phase I), Access (Phase II), Implementation (Phase III), and Outcomes (Phase IV). Situations that interrupted each set of strategies (labeled with stop signs on the diagram) were identified and the ways they were each overcome to move CE forward were listed. A feedback loop was added. These stops were interpreted as temporary roadblocks that necessitated a return to previous phases before moving forward. The diagram underwent several drafts over a period of 18 months during which overlap ideas were condensed from single idea concepts into groups of concepts (categories and subcategories) with labels and sub-labels; categories and subcategories were then further clarified, refined, and defined. Team input contributed to refinement. Directional arrows, lines, and roadblock placement on the diagram were examined and refined for the most accurate interpretation of the CE data. The diagram components were then examined for applicability across potential health problems. A theoretical analysis of older adult and cancer-specific parallel categories focused on devising a model comprising categories at a higher level of abstraction for potential use with other communities and health problems. For example, the contextual antecedents identified as characteristics of a target population were reworded to remove cancer-specific identifiers (e.g., “lives/works in cancer clusters” was reworded as “lives/works in target community” and “cancer diagnosis” was reworded as “target health problem”). The final diagram refinement examined grammatical and theoretical consistency of terms, parallel levels of abstraction, and further review of model components. Final refinement also included a comparison of the model to the literature. The four-phase model developed from the data describes categories that health professionals consider in initiating CE. Figure 1 shows three sets of contextual antecedent characteristics (i.e., characteristics of the target population; characteristics of person/organization providing services and resources; financial characteristics), which serve as baseline parameters for the CE, identify the scope and limitations of the targeted CE, and reveal the potential for achieving the proposed outcomes. 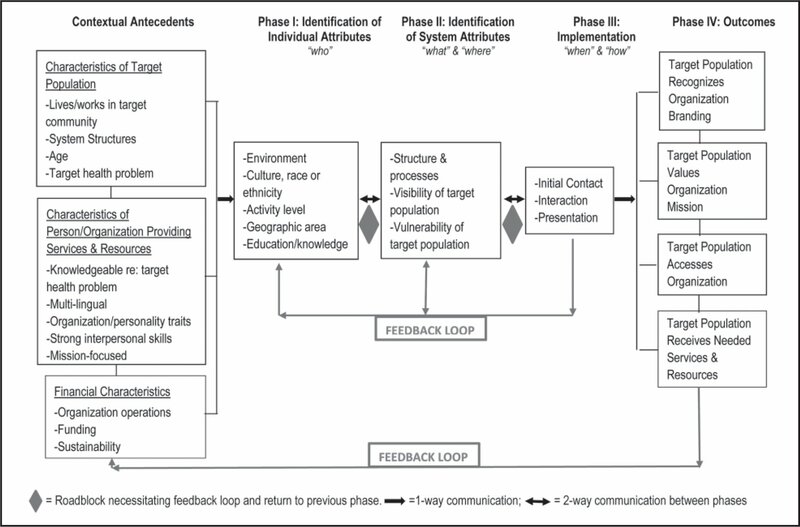 The four phases of the model (i.e., identification of individual attributes; identification of system attributes; implementation; and outcomes) are purely heuristic; they were delineated by the study team. The sequential numbering of the model phases indicates forward progression. The length of time between each phase is not fixed and may vary from days to months. Definitions of model categories and subcategories and examples supporting the definitions are shown in Table 2. A right-facing arrow between the contextual antecedents and Phase I, and between Phases III and IV, assumes the preceding components of the model have been assessed fully; therefore, communication is one-way forward. A double arrow between phases (e.g., between Phases I and II) denotes two-way communication in which information may be needed from a previous phase to clarify information in a subsequent phase. A roadblock, denoted with a solid diamond shape (e.g., between Phases I and II and Phases II and III), indicates an obstacle between phases, a delayed forward progression, and a required return to the previous phase for reassessment or clarification before proceeding to the next phase. Spanish-speaking and African American older adults and family members were identified as missing demographics in engaging the community (Phase I). Therefore, the first roadblock the study team experienced was an inability to access these populations in the cancer clusters and their visibility within the settings targeted (Phase II). Three individuals were key resources to resolving this roadblock. The bilingual outreach coordinator, who was also serving as a member of the CCC staff, was the link to engaging Spanish-speaking individuals. A Steering Committee member employed by the New Castle County-based Latin American Community Center was knowledgeable about the settings within which the Latino population lived, worked, and socialized, and about potential venues to access. Another Steering Committee member who was a member of the diversity committee of the Delaware Cancer Consortium and liaison to Delaware African American churches provided contacts, facilitated entrée to these settings, and accompanied the outreach coordinator to events targeting the African American population. Gaining entrée to a local Spanish-language radio station and Latino and African American–sponsored events and settings helped resolve this roadblock. Change in a facility's care designation and lack of response or refusal to accept a request for engagement created the second roadblock. This roadblock diminished the visibility of older adults in nursing homes and assisted living facilities (Phase II) and prevented implementation (Phase III) in this population. As noted in procedures, 5% of settings no longer met study criteria, 12% of contacts did not respond after telephone and letter follow up, and 11% voiced no interest or said the topic was too depressing. Consequently, access to older adults in these settings was limited. Steering Committee members who were associated with the Delaware Aging Network and held administrative and clinical positions in nursing homes and assisted living facilities provided additional community contacts and notification of scheduled community events where the study team could engage family members of older adults in these settings. For example, family care groups were accessed for information delivery venues in senior centers and within the greater community. In addition, information materials were provided on-site to settings agreeing to have them available for residents. The refocus on alternative settings and venues to disseminate this information to older adults in nursing homes and assisted living facilities partially resolved this roadblock. The current study sought to gain knowledge about community outreach to older adults affected by cancer and their family caregivers, and to use that knowledge to inform the development of a standardized process model that would guide CE. The model generated proposes a CE process that (a) is complex, (b) is non-linear, (c) has obstacles between phases that may delay forward progress, (d) has unidirectional and bidirectional communication between phases, and (e) has feedback loops. This model groups and labels characteristics of the target population, the service-providing organization, and financial characteristics as contextual antecedents and focuses on how a community encounters the system and engages an organization. An assumption underlying this model is that target communities change over time, including their systems and individuals; therefore, the feedback loops allow for reassessment of the contextual antecedents and components in the four phases for a continuous flow of activities to sustain the CE process over time. In Phase I, the identification of individual attributes on five components extends and specifies participants in the target population who receive information at the onset of CE. Examining these attributes throughout the CE process ensures representation and diversity by demographics of the target population. For example, CE settings included senior and community centers in rural, urban, suburban, and coastal areas that served individuals of diverse ethnic/racial and language backgrounds and were within the geographic boundaries of the cancer clusters. Inability to access African American and Latino older adults and their families entailed identification of additional settings and Spanish language venues that served these populations. In Phase II, the focus on identification of system attributes is specific to those structures to which the target population is associated. For example, CE was implemented in places that older adults live and socialize, incorporating the processes within these structures, and the visibility and vulnerability of older adults' diagnoses or risk for cancer. Residences included homes and apartments in which older adults live alone or with others, assisted living facilities, and nursing homes. In each of these residential structures, there are rules and points of access about which older adults may have little control or input. In addition, cancer, like other health problems in vulnerable individuals, may be invisible or its symptoms difficult to detect or differentiate from frailty and other changes associated with aging, comorbidities, and functional deficits. One challenge to engaging older adults in long-term care was refusal by administrators to participate in CE or lack of response to contacts, resulting in limited access. This limited access may be explained by negative perceptions about cancer (e.g., “too depressing”), and security, privacy rules, and regulations designed to protect older adults. In those instances, the study team shifted the focus to CE with health care professionals and family caregivers in the community, informing them of cancer helpline services. Phase III components are cyclical and continuous. Initial contacts may be hampered by an inability to connect to the designated key contact person due to competing schedules, availability, other priorities, and purposeful avoidance. Specific guidelines and a script for contacting participants are essential for delivering a consistent, meaningful, and trustworthy message that is valued by the intended contact. In addition, these materials standardize and contribute to CE integrity. The interactive aspect of Phase III comprises an extension of the message, an opportunity to provide further details about services, and ability to determine and schedule delivery of the information to a broad audience of participants. Branded information materials and handouts about cancer screenings are tailored to fit the characteristics of participants and cancer cluster. Phase IV denotes the CE proposed outcomes that the target population will recognize, value, access, and receive needed services from the service-providing organization. The focus in Phase IV is greater than recognition of a service by name alone. Outcomes tie a need to a brand to ensure that the type of services needed will be recognized and valued at the time they are needed, and individuals will be comfortable in accessing the services via telephone. Outcomes should be measurable, and with a telephone helpline such as in the current study, the end result of CE will be the number of and reason for calls received, population served, and resources provided to address callers' concerns (Klemm et al., 2014). Conceptualization of Community. A systems approach to the conceptualization of community is one of four ways in which McCloskey et al. (2011) summarized the concept of community from existing CE literature. Guided by a CBPR design and Systems Theory, the model generated from the current study is a systems approach to CE as depicted in its structure, process, outcomes, and feedback loop framework. Individuals have a sense about communities to which they belong. Community stakeholders were engaged as members of a Steering Committee, media outlets, and community participants to achieve an understanding of the insider's perspective of community from the primary language spoken, family, place of employment, residence, social club, ethnic background, and religious affiliation of the population (McCloskey et al., 2011). One strength of this model is its incorporation of social and political perspectives of community (Dozier et al., 2011). Consistent with an instrumental CBPR approach focused on educating a community and incorporation of a virtual perspective of community (Dozier et al., 2011; McCloskey et al., 2011), e-mail blasts to elected statespersons were used as an information delivery strategy. Roadblocks occurred before and after Phase II, requiring a need to return to the previous phase for reassessment, clarification, and resolution before proceeding. The identification of roadblocks and resolutions in the CE process is a second strength of this model. Conceptualization of Engagement. The literature on engagement conceptualizes CE as continua depicted in process frameworks/approaches and levels of interactions. Many of these frameworks provide guiding principles and relational statements about promoting health of a community (e.g., social ecology and health promotion models [Best et al., 2003; CDC, 2011; Stokols, 1996]), the nature of interactions between a community and engaging organization (e.g., Active Community Engagement Continuum [Russell et al., 2008]), communication of information (e.g., diffusion of innovations [Rogers, 2003]), and collaborative participatory research (e.g., CBPR [Israel et al., 2005; Minkler & Wallerstein, 2003]). Most of the CE literature labels and defines certain variables that shape engagement but does not necessarily define or group them as contextual antecedents. An exception is the CBPR approach that provides broad categories for contexts (e.g., social, cultural, and environmental importance of the health issue). The model derived from the current study refines the broad CBPR context with specific characteristics about the community and engaging systems. In addition, in contrast to CE as a continuum of how to engage a community, these results present CE comprising three distinct periods (phases) and categories that health professionals consider in initiating CE. Furthermore, this model partially addresses the plea from Best et al. (2003) for greater systems thinking to sustain dialogue that enhances community partnering and shared experiences and decreases the research–practice gap in promoting health of a community. Cancer Incidence. The cancer burden for Delaware continues to be a threat. In 2015, the latest year for which incidence data are available, Delaware's all-cancer rate had decreased to 490.6 per 100,000 individuals; however, Delaware remains one of 12 states with the highest cancer rates, ranging from 468 to 512 per 100,000 individuals (CDC, 2018). One limitation is that this empirically generated model has not been fully evaluated. Future research should include evaluating the relevance, feasibility, and usefulness of the model in providing CE to a larger older adult population with cancer (e.g., multistate) or young adult population with cancer. The age group used for the generation of this model was older adults; therefore, another potential research direction might be an evaluation of the model with another health problem that is commonly seen in older adults (e.g., heart failure). Researchers, clinicians, and community stakeholders might collaborate with experts in an agency such as the American Heart Association or a cardiovascular clinical or research center to conduct a study that is guided by the standardized approach outlined in this model. A second limitation is that the model does not elaborate on any type of sustained engagement or relationship. After completion of this study, CCC obtained additional external funding to maintain staff hired for this study and continue engagement with older adults in the community. The study team recommended that the CCC seek a continuing source of funding to continue to evaluate their sustained engagement. Evaluation of CE is critical to determining the outcomes of engagement efforts. The current model serves as a guide to standardize CE that informs a community about services to address an identified health problem. The CBPR engagement in this study was transitional with two-way communication and an evolving trust between the initiators of the engagement and the target community; the initiators maintained control (Bowen et al., 2010). These findings extend the dialogue about the important topic of engagement within communities to ensure access to health care, prevention of disease, and health equity (CDC, 2011). Gaining an insider's view with the collaboration of community stakeholders is essential for the transfer of knowledge and use of services and resources by target groups to meet their psychosocial health problem needs. Prior knowledge of a community to deliver the best possible health care is an essential role of nursing and other health care professions. The rich context, detail, and insights leading to a usable model promise to contribute to improving community health and health care (Williams, Bray, Shapiro-Mendoza, Reisz, & Peranteau, 2009). Data from the CCC helpline revealed that few older adults with cancer or their family caregivers were using the free service or were aware of the services, despite the prevalence of cancer in this age group. The model generated from the current study provides a guide for outreach to older adults who may not know about available services to assist with cancer and other health problems that are prevalent in this age group. Creswell, J.W. & Poth, C.N. (2018). Qualitative inquiry & research design (4th ed.). Thousand Oaks, CA: Sage. Institute of Medicine. (2007). Cancer care for the whole patient: Meeting the psychosocial health needs. Washington, DC: The National Academies Press. Israel, B.A., Eng, E., Schulz, A.J. & Parker, E.A. (Eds.). (2005). Methods in community-based participatory research for health. San Francisco, CA: John Wiley & Sons. Kleinman, A. (1980). Patients and healers in the context of culture (Vol. 3). Berkeley, CA: University of California. Minkler, M. & Wallerstein, N (Eds.). (2003). Community-based participatory research for health. San Francisco, CA: John Wiley & Sons. Patton, M.Q. (2002). Qualitative research & evaluation methods (3rd ed.). Thousand Oaks, CA: Sage. Spradley, J.P. (1980). Participant observation. New York, NY: Holt, Rinehart & Winston. Contextual antecedents Interrelated characteristics that frame the scope and limitations of community engagement (CE); precede the initiation of a CE process; and encompass the target population, the person/organization providing services and resources, and the organization's financial characteristics. Assessment of these characteristics determined the study collaborators and Steering Committee. Characteristics of target population Identification of the target population as members of the target community by nature of their residence or employment, the system structures within which they live or are employed, their chronological age, and risk/prevalence or diagnosis of the target health problem. Older adults living in Delaware (DE) cancer clusters, in own home/apartment, in a nursing home, in an assisted living facility, and at senior centers. Characteristics of person/organization providing services and resources Attributes that illustrate ability of an organization and outreach individuals to provide services and resources that meet the target health problem needs of a target population, including: knowledge of target health problem; multi-lingual; organization and personality traits, such as persistent, intuitive, resourceful, flexible, credible, and seizes/maximizes opportunities; strong interpersonal skills, such as articulates, listens, negotiates, asserts, solves problems, and explores and analyzes options; and mission-focused, with a clear vision of expected outcomes. Cancer Care Connection (CCC) provided psychosocial cancer services/resources; Cancer Resource Coaches© answered telephone helpline; bilingual (Spanish–English) outreach coordinator; CCC mission is cancer-focused. Financial characteristics Attributes of CE that illustrate sound financial backing, evidenced in organizational operations, funding, andsustainability that support CE aims, anticipated outcomes, long-term budget goals, and future funding to fulfill organization's mission. University, medical center, and community-based collaborators; strong financial structures; National Institutes of Health award. Phase I: Identification of Individual Attributes Attributes identifying target population by environment, culture, race/ethnicity, activity level, geographic area, and education/knowledge that shape a desire/ability to engage. DE cancer cluster demographics determined attributes sought. Self-identified race or ethnicity, dominant language, and expressed beliefs and values. Urban-rural classification (<ext-link ext-link-type="uri" xlink:href="census.gov" xlink:type="simple" xmlns:xlink="http://www.w3.org/1999/xlink">census.gov</ext-link>); access to technology, transportation, and resources. Level of schooling; health problem knowledge. </list-item> Cancer clusters in urban, suburban, and rural communities in DE; dominant language: English and Spanish; sedentary and active older adults. Phase II: Identification of System Attributes Attributes identifying an organization to which the target population is associated: structure and processes, visibility of target population, and vulnerability of the target population. These elements shape how the target population relates to the engaging organization. Access to older adults with cancer living in nursing homes and assisted living facilities was system-regulated/ controlled. Rules, layers/points of access (complexity, trust, and security), leadership, and decision making. Ability of organization to identify and assess individuals with potential/actual need for services. Ability of organization to illustrate history of meeting perceived need to fulfill required services. </list-item> Scheduled access to older adults at agency events and community activities; restricted access to older adults living in facilities. Phase III: Implementation Outreach activities between the engaging organization and target population include initial contact, interaction, and presentation phases. Stepwise approach used to engage with older adults in cancer clusters. Content and mechanisms are defined/carried out. Focus on purpose, services, and access to resources available to target population. Lectures or events about the resource information available, delivered directly to target population or professionals who would link the information to the target population. Consider following issues: potential contact obstacles, barriers to accessing target population, timing, matching schedules, and decisions about and preparation of branded materials for delivery of information. </list-item> Cancer outreach coordinator made contacts by telephone, e-mail, and letter; used stakeholder advice for identifying key individuals at facilities; and tailored content for older adults and professionals. Phase IV: Outcomes End products of the community engagement to inform or transform target population. CE goals and CCC mission/vision focus. Target population recognizes organizational branding Branding symbolism matches organization's mission and vision, is consistently applied to all distributed materials, and communicates a meaningful message to stakeholders and clients. Organization hired consultant to match brand symbolism with mission and vision. Target population values organizational mission Organizational mission focuses on addressing a public health problem that is prevalent in the target population. Cancer incidence and identification of clusters and need in DE aligned with CCC mission. Target population accesses organization Access mechanisms are clearly identified and communicated and able to be managed by target population. Callers seeking cancer resources access CCC telephone helpline. Target population receives needed services and resources Evidence that target population is receiving services and resources that fit health problem needs. Cancer Resource Coaches provide psychosocial services via telephone helpline. Dr. Rempusheski is Jeanne K. Buxbaum Chair/Professor Emerita of Nursing Science, and Dr. Klemm is Professor and Director, Accreditation and Outcomes, University of Delaware, School of Nursing, College of Health Sciences, Newark, Delaware; and Ms. Adams is Family Nurse Practitioner, Low T Center, Dallas, Texas. The authors have disclosed no potential conflicts of interest, financial or otherwise. This project (Academic-Community-Clinical Engagement for Support and Successful outcomes [ACCESS]) was supported by grants from the National Center for Research Resources (5P20RR016472-12) and the National Institute of General Medical Sciences (8 P20 GM 103446-12) from the National Institutes of Health. The authors acknowledge the Cancer Care Connection staff and Executive Director, Janet Teixeira, for their collaboration during this project. Address correspondence to Veronica F. Rempusheski, PhD, RN, FAAN, Jeanne K. Buxbaum Chair/Professor Emerita of Nursing Science, University of Delaware, McDowell Hall, 25 N. College Avenue, Newark, DE 19716; e-mail: vrempush@udel.edu.